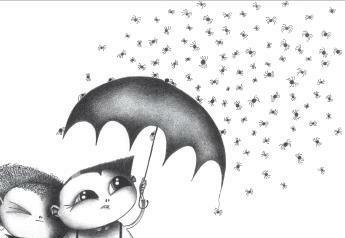 Kathryn Boyle illustration: Shower of Spiders! Is it raining or snowing where you are? It's pretty miserable where I am but at least this is not happening!! These poor little children won't be able to fend off the shower of spiders for much longer....he even has plugs in his ears! This is only a section of this drawing but you can nip over and see the full picture. I found some funny images and quotes about spiders on pinterest...I could spend far too long looking at that site! Love it!